Hello everyone! Late post, I apologize. 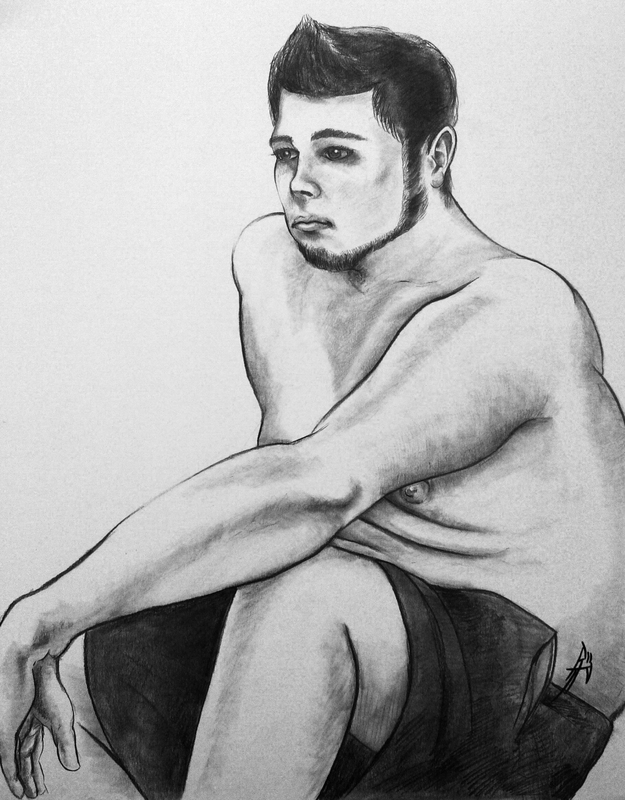 I have for you now my figure drawing final! I hope you enjoy it. Instead of a female I chose to draw my good friend Derek Morin. He was rather pleased with how this turned out. The final was 3 hours long and I had to use nothing other than pencils and bristol board. It was 18″x24″ in size. I was pretty impressed with myself that I was able to whip something like this out so fast! I guess I am learning something. I am not entirely happy with the face in this, but mostly the body. Funny, how I spent the least amount of time on it and mostly on the portrait. Let me know what you think! 3hr Drawing - Pencil + Bristol @ 18"x24"
As for the previous class, I thought I had a pretty good final drawing in it. It was our longest drawing yet with a live model coming in at 45 minutes! I found the pose to be exciting and it had some good lighting and shadows to work with! I apologize for the crappy photos. The quality isn’t as good as my scans, but I don’t know how else to capture these large images other than my cell’s 5MP camera. Here it is! 45min Drawing - Pencil, Charcoal, and Marker @ 10"x24"
I have a Toon-Boom animation that I’m working on. I’m cleaning up just a little bit of it to give it that “icing on the cake”, but it should be ready for upload soon. I really want to show it and do more of them! Hopefully I’ll have it tomorrow! This entry was posted on 03.10.2011 by Ryan M Paxton. It was filed under Artwork and was tagged with anatomy, charcoal, drawing, female, figure drawing, finished piece, male, marker, pen, pencil, sketchbook, sketches. These are really good! I see your style maturing!